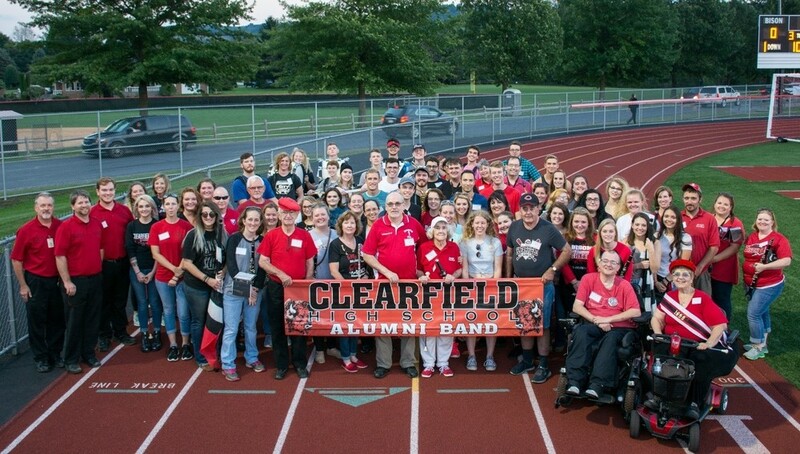 At the homecoming football game on Friday, September 21 at the Bison Sports Complex, approximately 80 Clearfield Music alumni were in attendance, and joined the current Bison Band on the field to perform the Fight Song, National Anthem, and Alma Mater. During the festivities, the Bison Alumni Band recognized three members over the age of 80; Thomas Bell, Gary Shugarts, and Dave Yocum. The Bison Alumni Band went on to recognize the first drum major for the Jr. High marching band, Cathy Irwin, who is celebrating 90 years of making music. This year also marks the 30th year of leadership by Mr. Raymond Mandell, Bison Band Director. This makes him the longest serving band director in Clearfield Music history. The Bison Alumni Band organizes every year during the homecoming football game. All Clearfield Music alumni are encouraged to participate in this yearly event. To sign up for email reminders about this event, please visit www.BisonAlumniBand.weebly.com. You can also visit Clearfield Music on Facebook.